Only one of them sits in my lap and as a result is frequently in picture range. Lucy and Bridget are older, more refined ladies who are happiest with an occasional scratch and then prefer to nap in peace and quiet. Away from little black pugs and viewfinders. Somehow, even if I am trying to be all casual about it acting like I’m just on the phone or looking something up – they always seem to know that I am taking their picture. And then they throw me dirty looks and move away or out of the position of unbearable cuteness! 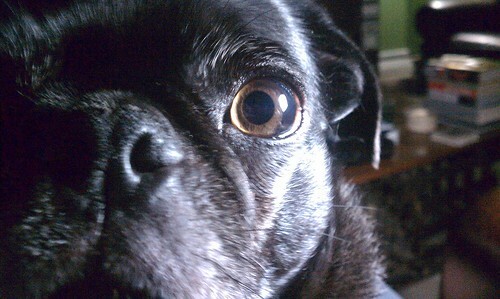 So the blog is black pug heavy as a result. but OMG how damn cute is he???? Ridiculously cute. They’re all so sweet! He’s cute all right. He’s also very intense. One has to look away or one’s eyes will get stuck on him.